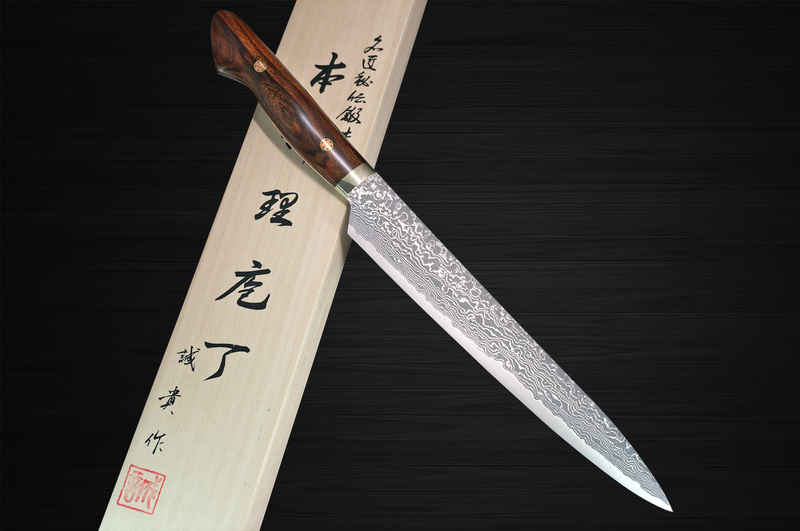 Due to very limited inventory and their popularity, the legendary slicers by Shigeki Tanaka are expected sold out as soon as they got in stock. 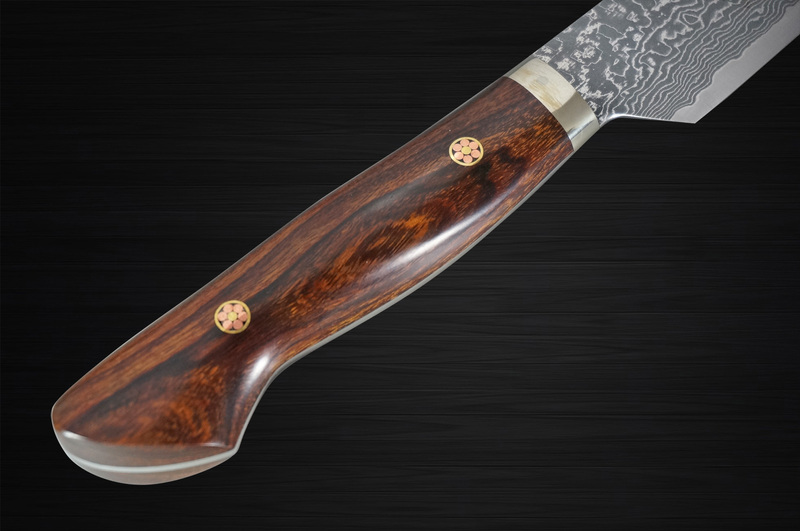 The Black Finished Beautiful Damascus Blades with Ironwood Handle must impress you & your loved one because of the extraordinarily sharper edge than all the other SG2 blades in the world. 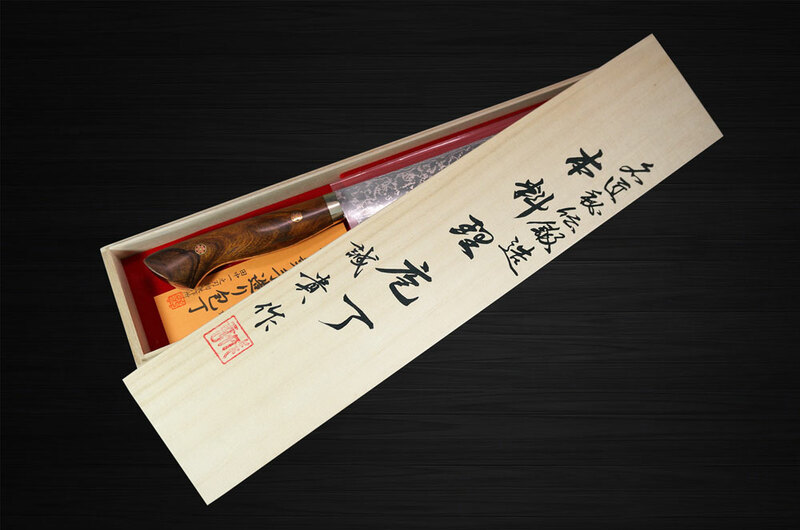 Some Michelin 3-star chefs in Europe gave a high marks to the Tanaka knives, and we recommend this premium kitchen knife series for professional chefs to enhance their art of cooking as well as for Perfect Gift. This Black-finished Japanese SG2 stainless steel is one of the hardest blade steel in the world. These masterpieces are carefully finished by the blacksmith Shigeki Tanaka for their top-rate cutting performance. The series realize long-lasting performance due to their rustproof blades, bevelled on both sides, and waterproof handles, making them the first choice among professional chefs. In addition to that, the high-end special handle mounted with a nickel silver ferrule is made of waterproof desert ironwood, the densest wood on earth. The pinning of the handle scales with rosette-shaped mosaic pins makes the knives real eye-catchers. The beautiful Paulownia Wood Box adds a touch of premium accents for the best present.